When it came to testing the all-new 2015 Ford F-150’s new features, we definitely put it through the wringer; but there’s only so much we could do in a controlled setting. So how do we test features like the hitch assist, the new tailgate and the productivity screen for real? We put Bradley Single — farmer, owner and operator of Single Bridge Ranch — behind the wheel and let him use the new truck for a full day’s work. Check out the video above. 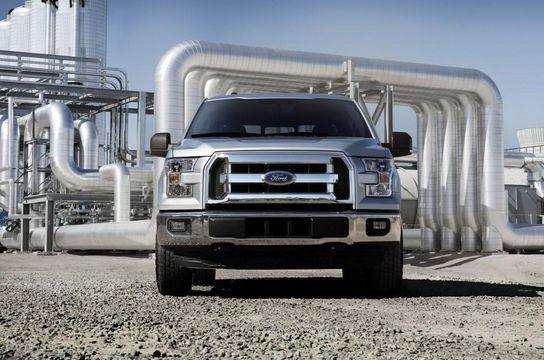 The 2015 F-150’s new features are true game changers for farmers like Bradley. The hitch assist system allowed him to safely attach a trailer by himself; the productivity screen gave him a real time glimpse of what was going on under the hood; and the tailgate handle bar made it safe to load up the back, even in the ice and snow. But the new truck didn’t just pass the farm test; Bradley even tried out the new car seat hooks to make sure the vehicle could easily transition from workhorse to weekend warrior. Bradley grew up in a true Ford family in Plumas, Manitoba. He and his father have been relying on F-Series trucks for generations because of the pure toughness and durability each vehicle brings to the farm. Bradley is constantly hauling cattle and massive hay bales, and trekking across acres of land multiple times a day, so there’s really only one series of trucks he truly trusts. For someone like Bradley Single, the all-new 2015 F-150 is a proven vehicle tough enough for farm life. Check out all of the specs and features of the new truck here, and leave us a comment below, on Facebook, or Tweet us @FordCanada. Come check out the new 2015 Ford 150 trucks down at Novlan Bros. Sales. Inside and out, aluminum changes the truck game for good! The move to using high strength military-grade aluminum alloy in the body structure of the vehicle is a major innovation for a high volume product, and the 2015 F-150 is the only truck in the market that’s made this way. But the impact of this change doesn’t stop there. The use of aluminum means a weight savings of 700 lbs., which translates into increased capability of the truck, noticeable as soon as you start driving. It responds better, feels lighter and more nimble, and is quieter than previous models. Along with the body composition, the new F-150 gains another EcoBoost engine option, meaning the future of tough offers the 2.7L EcoBoost with best-in-class gas consumption. As one of 4 engine options, it provides drivers with the combination of torque, horsepower, and fuel-efficiency that best suits their needs. Beyond these enhancements, the all-new 2015 F-150 is truly prepared for anything that work or the road brings, including the unfortunate incidents. “We’ve really been able to optimize the reparability of the truck and offer sectioning procedures and partial replacement procedures that we couldn’t do with the steel vehicle,” explains Larry Coan, Damageability Product Concern Engineer, Ford Motor Company. “We’ve gone in, looked at the design of the vehicle years ahead of time and tried to optimize the repairs; and the aluminum actually helps us do that.” Ford offers comprehensive dealer training and provides an F-150 Collision Repair Support plan to ensure that repairs are consistent across regions, making the 2015 F-150’s upstream design for reparability unlike any other in the market. The transition to aluminum also provided the opportunity to add key onboard technology features that really make this truck a beauty inside the beast. With 11 class exclusive features that have never been in a truck before, convenience and safety have been enhanced, and F-150 fans can now enjoy a BLIS system, cross-traffic alert, and lane departure warning, just to name a few. Particularly cutting edge are the safety increasing options of forward collision warning, which gives an audible and visual warning that a collision is imminent and starts to pre-charge the brakes to enable a faster stop, and a futuristic Active Park Assist that makes even the toughest parallel parking situation a breeze! All these game-changing upgrades have already resulted in the 2015 F-150’s all-aluminum body winning the AJAC Award for Best New Innovation Technology, but the praise for F-150 didn’t stop there. On the opening day of the Canadian International AutoShow, the F-150 drove away with the AJAC Award for Canadian Truck of the Year! Just in case you needed more proof that it’s truck love at first sight, check the all-new 2015 F-150 out for yourself and tell us which of its features is your favourite game changer! Come down to Novlan Bros Sales to see the new trucks and test them out youselves.